I have been using weduit Waterless Car Wash products for about 2 years. Here in south central Texas it’s been a struggle trying to keep our vehicles clean. We have been in drought conditions and this past summer we advanced to extreme drought conditions. We have been, and continue to be under mandatory water use restrictions. Thankfully, with weduit Waterless Car Wash I am able to keep my families’ vehicles clean. I use Complete Clean, DuduiTpro, Multiclean and Wheels. My favorite is the Wheels. I no longer have to scrub my tires in order to get them clean. This stuff works like magic. I spray all of my tires first, then I clean the rest of the car with the DuduiTpro by the time I’m done cleaning the care, the tires are dry and I’m ready to drive. The only negative (?) comment I have is that I am no longer able to put my car cover on by myself. The surface is so slick that the cover slides off before I can get it installed properly. It now takes two people to put the cover on, and my wife laughs every time I ask for her help. Too often claims are made by the manufacturer about their product only to be disappointed by the results we consumers actually receive. It is refreshing to use a product that actually performs as it’s claimed to perform. I would (and do) recommend weduit Waterless Car Wash products because they perform great and it’s friendly for our environment. Were we sceptical or what? Waterless bike cleaning? You must be joking! Having now tried weduit wipes we can honestly say that they do what they say on the tin! weduit is the result of two years of laboratory research and testing and comes supplied in a tub of 80 wipes soaked in 1 litre of solution and comes with a professional grade microfibre cleaning cloth.It’s simple, weduit is a fast , easy to use cleaning product suitable for all motorcycles, cars, vans, boats etc No hard rubbing necessary, just make a few circular moves with a weduit wipe, then polish the surface using the Microfibre cloth provided in the kit. Duduit degreases glass surfaces and leaves a waterproof layer helping water dispersal.Really effective at removing insect guts and residue. Duduit removes tar without the need for aggressive harmful chemicals. Revives dull plastic and paint finish.One tub contains 80 wipes and a micro-fibre cloth – cleaning a typical large motorcycle uses 2-3 wipes and a car approx 8-10 wipes. Professional grade microfibre cloth included with every tub. All the main active components in weduit are not harmful to any surfaces. Contrary to most cleaners available today, weduit contains soft polishing elements in order to eliminate micro scratches. The honeycomb structure of the wipe enables it to capture sand and silica particles. Duduit is unique in that it cleans without water. Using weduit is also a great way of keeping your motorcycle in great condition in the colder months. DuduiTpro Waterless is the ultimate exterior cleaning and detailing solution: clean, refresh, shine and protect with Nano wax technology. A totally ground breaking Environmentally Friendly and User Friendly waterless car wash system that can be used to clean, wax, polish and Nano protect any part of the car, motorcycle, boat, caravan and aircraft exterior surface, delivering a premium mirror-gloss finish in half the time of conventional waxing, provides UV protection, repels water and minimises dirt build-up. DuduiTpro Waterless Wash formula completely gives you the waterless freedom to clean and polish your full car exterior anytime, any place and everywhere the waterless green way, by fully negating the use of water without compromising on achieving the ultimate showroom finish and whilst caring for our environment. DuduiTpro contains many superior ingredients including Nano Wax, high-grade carnauba wax the world’s hardest natural protective wax, special wetting agents, lubricants, unique water-based polymers andprotectants bringing a truly breathtaking formula to the car cleaning, polishing, detailing and valeting world. Totally free from petroleum, petrochemical derived fragrances, petroleum based hydrocarbons, heavy metals, solvents and non aerosol. DuduiTpro Ultra Nano cleans, polishes and wax protects your vehicle and helps protect the environment too. Effortless showroom shine is instantly created on exterior paintwork, glass, mirrors, chrome, rubber, plastics, hard vinyl, alloys, wheels, trim and wiper blades preventing judder and drag. Eco friendly Advanced does so much more than just clean and shine your vehicle it brings out the natural brilliant colour pigments in your paintwork and protects it from both natural and manufactured harmful elements. Also amazing results achieved on Interior plastics, wood, mirrors and door trim. Directions forDuduiTpro use: Shake well before use. Quick and easy to apply simply spray initially onto a clean folded microfibre cloth to moisten. Then spray evenly on to the area to be cleaned, gently wipe off from target area and then quickly buff the same area with a second folded microfibre cloth to a beautiful shine. Continue process until you have effortlessly cleaned and polished the entire vehicle. Used in conjunction with Pearl Universal enables you to clean the whole exterior and interior of the vehicle. How does work the DuduiTpro: is a formula instantly encapsulates and emulsifies the dirt and grime particles on contact, which then allows the microfibre cloth to rapidly absorb and lift all the liquefied soils away from the surface without scratching the paintwork, safely forming a protective barrier between the dirt and the paintwork, preventing it from coming into contact with the vehicle surface again. The carnauba wax also provides a protective barrier dramatically reducing paint oxidisation and UV rays which are extremely damaging to painted surfaces whilst imparting an outstanding shiny, highly protective anti-static glaze finish which water will always bead on. This superior polished non-stick surface repells the dirt and dust ensuring your vehicle stays cleaner for that much longer. Such an important part of keeping your paint in tip top shape. They are available in pretty much every store. Unfortunately not all Micro Fiber Towels are the same. It is very important to be aware about the quality of your towels. Especially the once that you use on the paint. While I haven’t tried every towel out there, I feel comfortable in saying, that if you purchase from an online vendor, you will get quality towels. However if you go to your local store to pick some up, you have to be very careful. If you must, by all means get some towels, but be very careful wiping your paint with them. You do not want to scratch the paint.As always, the marring will be more noticeable on darker color cars, but you can mess up the paint just as easy, even if the paint is white. Imperfections, such as swirls, scratches happen only when you physically touch the paint. That is, when you wash your car, when you dry your car and in between washes, like when you try to wipe dust off of the surface. Wiping off wax or sealants is another time where you are in contact with the paint. It is crucial that you take great care of your paint otherwise you will end up with a paint that will not look up to par. I know of many cases, where someone would spend a whole weekend detailing their car only to realize that after polishing the paint for hours, they marred it, because the towels came from the local store and ended up inducing light swirling. Don’t make the same mistake, order quality detailing towels. I don’t mean to suggest to spend a fortune on detailing towels, but there is a nice medium between €16.00 for 30 some yellow towels vs €10.00 a towel. You want to make sure that the towels are 70%/30% and not 80%/20%. The latter is fine for interior work or for your wheels, windows, door jambs etc.. But try not to use them on painted surfaces. They “can” scratch. It was clear that the cleaning results would be very close. So, because the products themselves are similar, the final ranking came down to price and how the packs worked. The wiper weduit Waterless Car Wash starred on paintwork, so scores a narrow victory. Another US import, from Meguiar’s, just takes second thanks to a good performance on all surfaces. Final podium place goes to WOW, which comes with the cloths you need. Cut “Phantom Loads”: Many appliances use electricity even when they are off. Asmart surge protector ends that. Save money AND save the environment. Get your apartment/condo/townhouse to recycle: In Los Angeles, the city just recently began offering recycling for multi-unit dwellings. To sign your residence up visit larecycles.org. Insulate with Blown Cellulose (paper): Insulation keeps your home cooler or warmer reducing the impact on your HVAC system. It also sound proofs a space. The beauty of blown cellulose insulation is that it can be done after construction has already occurred. With just a little bit of patching, you can’t even tell anything was done (see photos here). Also, blown cellulose becomes highly compacted in the walls (because it is blown in) giving you a higher insulation value (R-value) than batting (rolled) insulation, and because it is treated with boric acid it is also a pest deterrent and a fire retardant. Finally, blown cellulose insulation is usually 100% post consumer waste and is very cost effective to install. Not all cellulose insulation is created equal though, so make sure the product is coming from a good company…and if you have a landlord, be sure to check with them before embarking on this. Beautify with fabric: A lot of times painting the walls, an easy way to perk up a place, are off-limits to those renting. In that case, textiles can do a lot to add color and visual interest to an interior without permanent changes. We recommend using organic bed linens or textiles. Wash Your Car Without Water: Most apartment dwellers are not able to wash their own cars at their apartments…which is good because you don’t want any harsh, not-earth-friendly detergents washing down the storm drains and into the ocean where it will contaminate beaches and lead to algae blooms (car washes are at least required to catch their run-off and direct it to sewage treatment plants.) But now there is a no-water car wash option that you can do yourself! Alegre Ramos is a Green Living Expert and LEED AP Interior Designer living in Encino, CA. She is the founder/owner of eco-living general store and design centerGreen and Greener. G&G offers a 10% off “no-driving” discount on in-store purchases. Check back every Monday for more ways to incorporate living green into your everyday life! Going to the car wash. Professional car washes are often more efficient with water use. They also dispose of the water properly, while when you wash your car at home metal and other toxic chemicals are washed in to the sewer and end up in our water ways. For a bigger impact use a waterless car wash like Eco Touch. Bring your own mug. Reusable mugs keep your drink warm longer, while saving a lot of waste. Most coffee shops will happily refill your mug and some even offer discounts. For a bigger impact only buy coffee at shops that use fair trade coffee. Skip the coffee stirrer. Americans throw away over 138 billion straws and stirrers. Put your sugar and cream in first and the coffee will stir itself. For a bigger impact skip straws in your soda. If you need the straw switch to glass or stainless stain straws. Be kind when you kill. Use vinegar to kill weeds. It will save you money and won’t hurt the environment or any pets or people. For a bigger impact skip fertilizer and just let your normal clippings do the work. Recycle those wire hangers. Wire hangers are almost always steel, which is not recycled by all recycling programs. Most dry cleaners will take them back. For a bigger impact buy hangers made from recycled plastic or other sustainable materials. Stop your junk mail. On average each American gets 40 pounds of junk mail each year. Services like Green Dimes will help you stop your junk mail. For a bigger impact stop receiving phone books and start using online directories to find phone numbers. Give it away. Before you throw something away, stop and think if someone else could use it. Either donate it or use a site likefreecycle.org. For a bigger impact if you can’t donate it find a way to reuse it in a craft or in some other way. Only wash full loads. You use the same energy and water to wash one shirt as you will to wash a whole load. You will save money on electric and water bills. For a bigger impact wash everything in cold or warm water. Skip the receipt at the ATM. It would save a roll of paper more than 2 billion feet long, or enough to circle the equator 15 times. For a bigger impact pay bills online. If everyone would pay online we could save around 18.5 million trees a year! Download your software. Software is often available for download. It will save you space and a lot of cds and packaging waste. For a bigger impact download your music from iTunes or similar sites. As someone who really cares about his vehicles, I’m always looking for the latest in car care products. Recently, a company called Eco Touch sent me samples of three of their car care products. With a name like Eco Touch, if you’re guessing they’re environmentally minded, you’d be correct. In fact, on the company’s website, they state they manufacture high-performance car-care products with minimal impact on the environment through the product’s life cycle. Hey, I’m all for products that minimize impact on the planet. So can you have an environmentally friendlier product that actually works well? There’s only one way to find out. 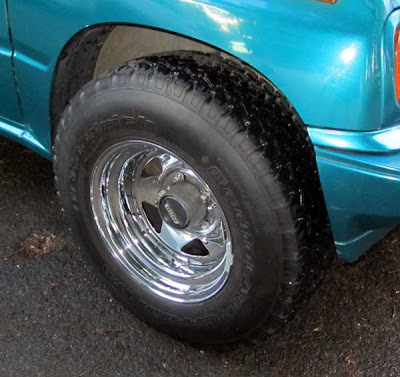 First I tried the Tire Shine on my Suzuki Sidekick’s 235/75/15 BF Goodrich All-Terrain tires. I’m not a fan of glossy, wet-looking tire products. Thankfully, weduit Renovator (applied with one of their applicators) offered up a low-gloss look—just what I like. The product did a nice job cleaning up the tires, taking away the tire’s brown, dry look and giving the tires a freshly cleaned appearance. By the way, the tires maintained their clean look for days after the application. Next, I hit up the wheels with Wheel, which did a great job making my chrome wheels gleam. Plus, this product can be used on household items, too—great considering we’ve got two stainless-steel garbage cans that often need cleaning. Lastly, I gave the DuduiTpro a shot on some tar splats located on my white Yaris’ fenders. I’m happy to report weduit’s product make short work of the tar. Yes, it takes a bit of elbow grease to get the tar off, but the product did the job well. It worked well on bug guts, miscellaneous road grime, and other greasy bits, too. Yes, this post might sound a bit like an infomercial, but I wouldn’t write about a product if I didn’t think it was worth writing about. And to come across a product that works well and isn’t made from harsh chemicals is a good thing. I think if you check out these products, you’ll likely come to the same conclusion. After writing about green car detailing last week, I contacted weduit about their Waterless Car Wash. I was looking to find green, eco friendly ways to keep the cars clean that would perform as well as my traditional products. Initially, their products looked good. weduit is very open about their products and what they contain which makes it easier to ensure that they are not a company guilty of “greenwashing.” Their Waterless Car Wash DuduiTpro is a plant-derived formula that is biodegradable and comes in a 100% recyclable bottle. I was really impressed to see that they listed the ingredients in their formula AND for their plastic bottle. It’s nice to see a company that’s honest about their product and not just trying to capitalize off of people’s conscience. This was precisely why I contacted them to try out their product. I’ve seen too many companies claim to be green without providing actual proof. Luckily, weduit was kind enough to provide me with the DuduiTpro and some microfiber towels. I was really hoping for some interior cleaner too, but hey, bloggers can’t be choosers right?